A Family That Bakes Together, Stays Together…we think that is how the saying goes. Well, at least that is our takeaway everytime we walk into Shortcakes Cakery & Cafe. I get such a happy feeling and always a warm greeting from the awesome family that runs it. Shortcakes is a cupcake bakery aka “cakery” in Mt. Juliet run by husband and wife team, Derrick & Nycole Donaldson along with their 4 children. Their business began with a divinely inspired Fruit Tea recipe which they sold at the local Farmer’s Market on Saturdays during the summer months. During this time, they also sold cupcakes to co-workers and friends. Cupcake sales were going so well, that they decided to bring some of her home baked cupcakes to the Farmer’s Market to “test the market” by giving away the cupcakes to their Fruit Tea customers. Customers were soon raving about the cupcakes and the Fruit Tea. Then one one day, Derrick and Nycole gave some cupcakes to an employee of Vanderbilt University. The cupcakes made their to the hands of the Administrator of Vanderbilt University’s Barnes and Noble Bookstore in Nashville, TN and soon after they received a call to This employee distributed the cupcakes at one of Vanderbilt University’s Administrator Meetings where the cupcakes found their way into the hands of the . A short time later, Derrick and Nycole received a call requesting the cupcakes to be sold in Barnes and Noble’s Bookstore Café. Not desiring to sell their cupcakes for resale out of their residential, non-certified kitchen, Derrick and Nycole had to make a quick decision – either to take all their savings and open a store front location and supply cupcakes to Barnes and Noble or turn down the offer from Barnes and Noble and continue selling to family and friends. 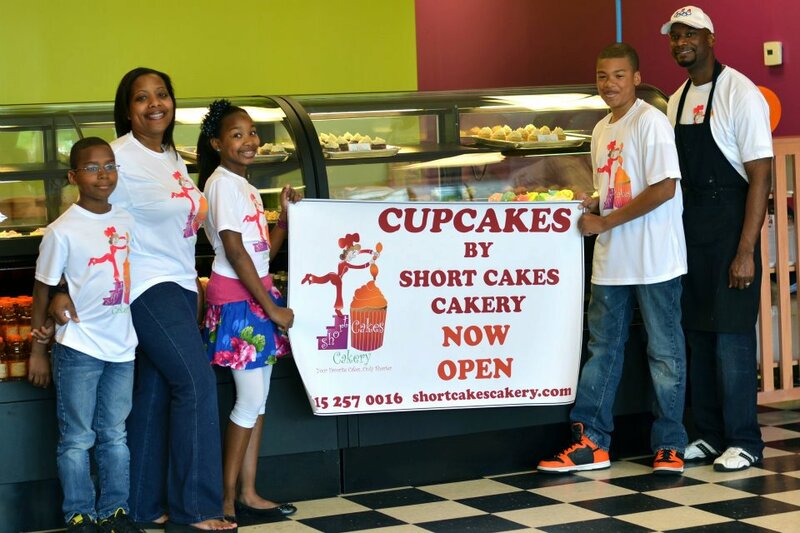 Derrick and Nycole emptied their savings account, took a HUGE leap of FAITH and opened Short Cakes Cakery in Mount Juliet, TN in February 2012 and they have been selling all kinds of “deliciousness” ever since. Why we love it: Their vanilla bean cupcake!! It’s absolutely delicious and don’t last very long when they are the features flavor of the day. You really can’t go wrong with any of their flavored and they also make custom cakes, a fab fruit tea and other fun goodies.